Finely mince up 2-3 chipotle peppers, depending on your spice preference. Stir them into 10-12 ounces of Coca-Cola Classic, along with 1-2 teaspoons of the adobo sauce. (again, depending on spice factor). Place meat in the slow cooker and pour the chipotle-cola mixture over the top. Cook on high for 4-5 hours, or on low for 7-8 hours. Once meat has finished slow cooking, remove and shred with two forks. Return to slow cooker and stir into cooking liquid, thoroughly mixing until most of the liquid has been absorbed back into the meat. Taste the meat and see if it needs salt. (OK, so technically that is a 4th ingredient, but does salt really count?) You also might want to consider stirring in more of the adobo sauce and/or more minced chipotle peppers. Remember, the slow cooking process really mellows most seasonings and sauces, so it is good to season at the end. 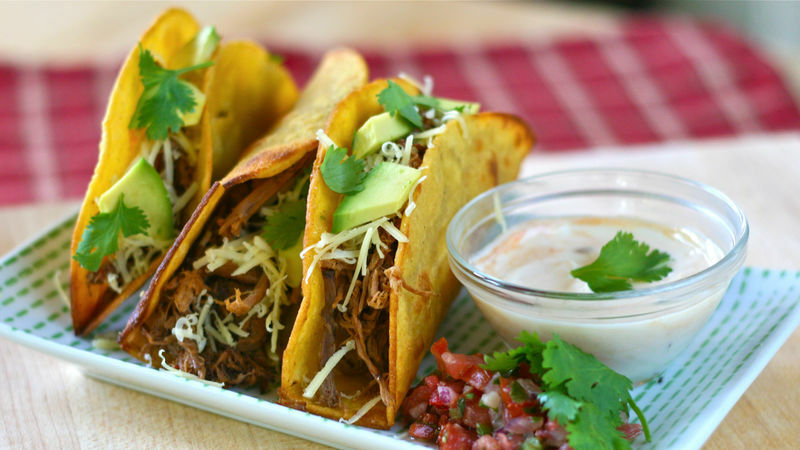 Serve with your favorite taco/burrito/torta toppings. OR use for beef enchiladas. Enjoy!